Learning how to smoke a tobacco pipe isn't as complicated as it seems. The number one complaint of new pipe smokers seems to be that they do not know how to correctly 'pack' their pipe, resulting in either dottle left over at the end of the smoke, or a hot smoke and the dreaded tongue bite, or a pipe that is hard to draw on. Here is compiled a step by step outline to the correct way to pack a pipe for maximum enjoyment. Packing and lighting a pipe, much like smoking a pipe, is an artform, and this technique may take some time to master, but once you have it down pat, one of the major stumbling blocks to pipe smoking bliss will have been removed. There are many methods of packing a pipe with tobacco. The method listed below works well for many folks and many different kinds of tobacco. It is, by no means, the only method of packing a pipe and experimentation is the key to finding a process that works well for you. (1) First, make sure your pipe is free from obstructions and left over ash from previous smokes. Run a pipe cleaner through the stem, dump out any dottle, and gently blow through the stem to expel any leftover ash. It is probably best to do this over a trashcan, large ashtray, or other such receptacle, pointing the bowl of the pipe upside down to avoid spewing dottle and ash into your own face. (2) Next, prepare the tobacco for smoking. Remove a small amount of tobacco from your tin/pouch/etc and lay it out on a flat surface. Gently pick apart any clumps in the tobacco, and make note of the moisture content of the tobacco. If it is too moist, you may want to let it sit out for a few minutes to dry out a bit. Go make yourself a cup of tea, pull an espresso, or open some mail. When you come back, it should have dried just a bit and be a little easier to deal with. (3) Lightly fill the your pipe with tobacco. 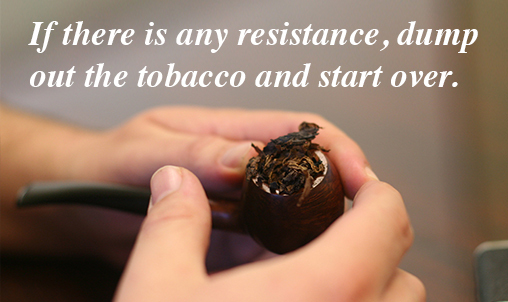 Holding your pipe, trickle strands of tobacco into the bowl of the pipe until it is filled to the top. resist the urge to push the tobacco down with your thumb half-way through this operation. Do not pinch the loose tobacco while doing this, as you will create more of the clumps you just took time to remedy. (4) Now, take your tamper/pipe-nail/etc and gently compress the tobacco. For bowls with straight sides, you should tamp gently until the tobacco half fills the bowl. For pipes with tapered bowls, aim for more like two thirds full. The tobacco in the bowl should have a very springy, almost soft consistency. (6) Once again, lightly fill the bowl of your pipe. Trickle loose strands of tobacco into the bowl of your pipe until it is once again full, perhaps even a tad over-full. (7) Again, tamp the tobacco down gently with your tamp. For straight sided bowls, the pipe should now be three quarters full. For tapered bowls, the pipe should now be five eighths or so full. You will probably find that to achieve this level of tobacco, you have to tamp with slightly more force than the first time. The tobacco in the bowl should feel springy. (8) Put the pipe to your lips and take a test draw. There may be tiny amount of resistance this time, but if you have any trouble drawing on the pipe, dump out the tobacco and start over. (9) Trickle a bit more tobacco into the pipe. Fill the pipe until a small mound of tobacco protrudes above the rim of the bowl, looking as if it needs a haircut. Return any left-over tobacco to its container for future use. (10) Using your tamp again, pack this tobacco down until it is even with the top of the bowl. This will take a bit more pressure than the first two tamping operations, but take care not to overdo it. The tobacco should still feel springy, only slightly less so than on the second tamp. (11) Put the pipe to your lips and take another test draw. The resistance should be minimal, like sucking on a straw. If there is any more than this, dump out the tobacco and start over. Lighting a pipe seems to be a very straightforward operation. You apply open flame, whether from a match, pipe lighter or other such contrivance and puff on the pipe until it is lit. Well, to get maximum enjoyment out of your pipe, and to minimize the need for mid-smoke relights, it is important to pay attention to your technique here, as with any other aspect of smoking. Here are a couple of easy steps to ensure a nicely lit pipe. (1) First comes the 'charring' light (also called the 'false' light). The purpose of which is to expel any extra moisture from the tobacco and prepare a nice even bed for the 'true' light. To achieve this, light your match or lighter and apply it to the tobacco, moving it in a circular motion around the entire surface of the tobacco. While doing this, take a series of shallow puffs on the pipe. It may be that the tobacco swells up in a spot or two and seems to unravel. 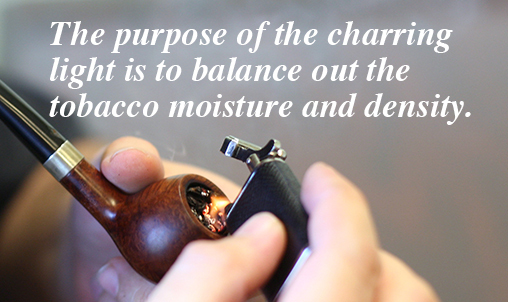 That is the purpose of the charring light, to balance out the tobacco moisture and density. (2) Allow this light to go out and tamp the tobacco back down even with the top of the bowl. You may find it useful to twist or spin your tamp in a circular motion while doing this. This is the point where many pipe smokers ruin a good packing job by tamping too hard. You should use a very light touch, wanting only to return the tobacco to the level it was before the charring light. (3) Relight your match of lighter and apply it to the tobacco, moving it in a circular motion around the entire surface of the tobacco. While doing this, take a series of shallow puffs on the pipe. This time the tobacco should not unravel and puff up as it did before. Extinguish your source of fire, sit back, relax and enjoy your pipe. It takes time and practice to master this technique, but you should see steady improvement in your form and in the ease with which you can pack your pipe as you progress. It is not uncommon for it to take six months for this technique to become second nature. Don't worry too much about relights. Relighting your pipe is a fact of life, and only rarely, if at all, will you have a smoke where you do not have to relight at least once. You will probably find that as your smoking progresses, you will relight less and less frequently. To see Jeremy Reeves give a demonstration of these techniques, check out his video blog. You can also explore Jeremy's similar video blogs on flake tobacco, crumble cakes, and rope tobacco.